Just after Carnival Splendor broke down this week, and the line said it was going to have to finish the cruise at reduced speed (canceling two ports to make it home on time), now word comes that Carnival Paradise sailing out of Tampa is also experiencing an ongoing propulsion problem which will be affecting cruises into June. The complete story appeared in the March 3 edition of Cruise News Daily. Princess is inviting UK agents to visit their ships and bring their kids. Details appeared in the March 3 edition of Cruise News Daily. If you love sea days, you should be aboard Carnival Splendor. Three days into the cruise, the ship has developed an unspecified “technical problem” that is affecting the propulsion system and is limiting the ship's maximum speed. The complete story appeared in the March 2 edition of Cuise News Daily. (Miami, FL – March 02, 2017) Ultra-luxury Silversea Cruises has appointed Barbara Staiger as vice president of strategic partners. Staiger will report to Christian Sierralta, vice president of national accounts and Latin America. Staiger has over 23 years of experience within the luxury cruise industry, spending 18 years as a sales director for Regent Seven Seas Cruises and five years as vice president of key accounts. As vice president of strategic partnerships, Staiger will be responsible for maximizing revenue opportunities and increasing market share with affiliated roll-ups and key accounts. "I'm thrilled to be joining Silversea and I look forward to enhancing and growing the strong relationships Silversea has established with our valued travel agent partners," said Staiger. Carnival Sensation has returned from dry dock at the Grand Bahama Shipyard in Freeport, and it has been loaded up with many of the FunShip 2.0 facilities. Another perfect score for Holland America's Eurodam. It aced its USPH inspection for the 11th time. Majestic Princess will be delivered at the end of this month for a short preview in the Med for western fans. Then it will be off to its new home in China. A sneak preview is in the video below. Norwegian Pearl returned to Miami yesterday completely refurbished and ready to resume its winter Caribbean program. Unlike many dry dock refurbishments, which renew just some public rooms, or just the upper category suites. Norwegian Pearl's covered the entire ship - many of the public rooms and each stateroom of every category. Viking Sky embarked on its maiden voyage from Civitavecchia to Barcelona. Details appeared in the February 28 edition of Cruise News Daily. Seabourn Sojourn's Alaskan expedition team for 2017 will be headed by Robin West. A veteran of more than 40 Antarctic voyages to date, West led the expedition team during Seabourn's highly successful first season in Antarctica in 2013. With wide-ranging experience gained along the way, he is now in charge of all aspects of expedition operations for Seabourn. Peter Damisch, Historian & Lecturer - Beyond explorations of polar, temperate and tropical regions, Damisch has written about ancient civilizations, sailing, navigation, weather, leadership and world explorers. A former president and CEO of several NASDAQ publically traded corporations as well as a retired U.S. Navy Captain, he is a licensed Master Captain of more than 190 sail and motor vessels. Greg Horn, Naturalist & Zodiac Driver - Following his schooling and military service, Horn fueled his dual interests in business and adventure by starting a SCUBA diving center along South Africa's famed Garden Route and later running a bush camp and dive resort in Mozambique. A certified diving guide, he has completed over 5,000 dives in the Indian Ocean and Red Sea. Paul Lazarski, Kayak Guide & Zodiac Driver - Ever drawn to nature, Lazarski has worked and explored some of the world's most scenic locations, including both Poles. For the past 30 years he has been working as a wilderness and wildlife guide, outdoor educator, historian, naturalist and Wilderness First Aid Instructor. Moira Le Patourel, Naturalist & Zodiac Driver - With her diploma in Renewable Resources, Le Patourel has carved out a niche as an adventure guide and naturalist on the coast of British Columbia, including seven years guiding in the Great Bear Rainforest. Kate Rannaste, Naturalist & Zodiac Driver - Having spent her youth exploring wilderness and wildlife in the Blue Mountains of New South Wales Australia, Rannaste was bound for the adventure industry. A seasoned explorer of the Polar Regions, she spends most of the year on expedition ships sharing her passion as a general naturalist. Juan Carlos Restrepo, Expedition Leader - Hailing from the coffee-growing region of Colombia, Restrepo has a graduate degree in geology and is a certified Dive Master. Spending three months of the year in the Arctic and three months in Antarctica, his various expedition experiences include the Americas, Africa, Asia, Europe and Australia, and sailing throughout the Atlantic, Pacific and Indian Oceans. Richard Sidey, Photographer, Videographer & Filmmaker - An award-winning environmental filmmaker and international nature photographer, Sidey has spent more than a decade documenting the profound beauty of the world's Polar Regions. His poignant nature documentary, Speechless - The Polar Realm (2015) won multiple awards and was hailed as "a transcendent cinematic experience." Chris Srigley, Assistant Expedition Leader - Drawn to extreme weather conditions, Srigley spends up to nine months a year on expedition ships, including full seasons in Antarctica and the Arctic. Along with regular duties on the expedition team, he serves as a Polar Bear Guard advancing landing parties and keeping a watchful eye while guests experience natural wonders around them. Rachel Sullivan-Lord, Marine Biologist & Lecturer - An avid scuba diver and sailor, Sullivan-Lord has studied critters both small and large from coral to blue whales. When not working in research labs, she divides time as a whale watch naturalist, whale skeleton articulator and more. Dr. Sean Todd, Whale Expert & Lecturer - A marine mammal researcher for nearly 30 years, Todd's areas of focus are human-marine mammal interactions. He has enjoyed a long career as a professional guide and naturalist, and has worked in a variety of polar and sub-polar regions, including 10 seasons in the Antarctic and 10 years in the Canadian sub-Arctic. Kirstie Yeager, Researcher & Lecturer - Yeager has spent more than two decades studying and working in natural resource management and wildlife research. Her extensive background includes studying grizzly bears in Montana, Steller sea lions in Alaska, and several species at McMurdo and Palmer Stations in Antarctica. Aliscia Young, Photographer & Videographer - An award-winning photographer and videographer, Young is inspired by her love of photographing nature, indigenous communities and ancient traditions. She has worked on expedition vessels from Antarctica to the Arctic, and her photography has been featured in galleries worldwide. Carnival Corp reports they have reached the 60% mark in their program to install scrubber technology on their global fleet of ships. The technology removes the vast majority of pollutants from the ships' exhaust gases, enabling the ships of Carnival Corp meet new environmental regulations which limit the amount of sulfur content of emissions to less than 0.1%. The system works by using filters and seawater to “scrub” the ships' emissions. The complete story appears in the February 27 edition of Cruise News Daily. Silver Muse completed sea trials and returned to the Fincantieri yard near Genoa. Queen Mary 2 arrived at Sydney early Sunday morning as part of a Royal Rendezvous with Cunard's Queen Elizabeth. When the iconic ship sailed into the harbor it paused by one of Sydney's most recognizable landmarks, the Sydney Opera House to give Sydney residents a spectacular view of the grand ship. 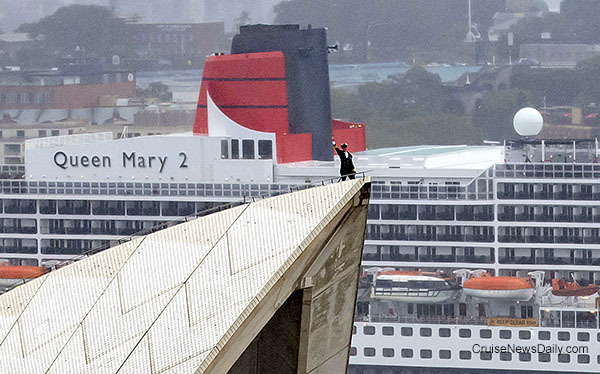 But what's that atop one of the Opera House's sails? It's Queen Mary 2's master, Capt. Chris Wells waving hello to Sydney. Few people have a selfie like this. Photos courtesy of Cunard Line, copyright James Morgan. All rights reserved. May not be copied or used without express permission. 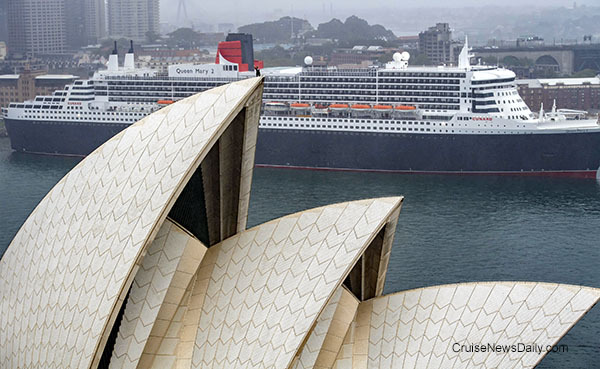 Enjoy Queen Mary 2's arrival into Sydney a bit faster than it actually happened, and now you'll better understand the end on this video.